There are SOOOOO many options and hundreds of possible combinations to box and wrap. Today, I'm going to show you some of my favourites to get your shopping list started. Perfect for travelling with, Jelly Masks are ideal to keep your skin cleansed and hydrated. There’s no need to refrigerate them either, so you can pop them in your luggage and they’ll last up to four months. Each cooling mask is easy to use; simply scoop a piece into your palms and blend until the jelly turns into a cream. Smooth onto your face, then leave the ingredients to sink in for up to 10 minutes. Finally, wash off with warm water or with a cloth to reveal wonderfully radiant skin. Featured in the snap above is one of my fave mood boosters, Baked Alaska, right next to the huge bath bomb-like spheres. When you’ve bin feeling sad and blue, bake it off with lemon myrtle and grapefruit oils. Citrusy suds and ylang ylang oil will lift the mood and sabotage sadness. With bright baubles of in-tents-ly softening Fair Trade cocoa butter your skin will feel moisturised and smooth. Feel Mary and bright and lather this up on your soggy bottom. Do away with tutu much packaging and dance naked this Christmas. Kalahari melon and organic jojoba oils moisturize for super soft Christmas kisses. Sweet wild orange oil gives you a happy lift which will have you dancing all night long. This colourful, candyfloss-scented fun is a little bit magical. Handmake your own festive fairy in soft pink and set her at the top of the tap so she can cast a spell over bathtime. Crumble a little under running water for streams of spellbinding, candycoated bubbles which turn the water into a wonderland of sweetness, or lather up in your hands for a sugary sweet body wash.
Tree-D quietly melts away as it gently transforms the water into a softening pool of almond oil and Fair Trade organic cocoa butter. Delicate scents of tangerine and grapefruit float by on the breeze while litsea cubeba oil restores you to your natural state. Allow the noise of the day to fade into the distance until it’s just you and the trees. This pear-fect little soap creates a luxurious lather on the skin. Pear purée and cardamom oil cover skin in a scent reminiscent of warm fruit desserts and spiced cakes while murumuru butter moisturises and softens skin. 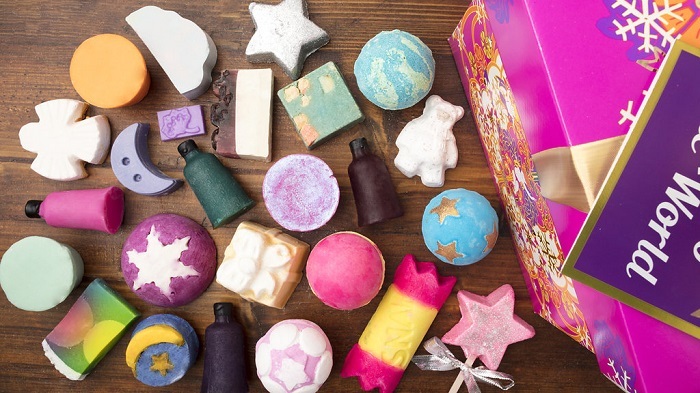 A classy addition to any Christmas bath or shower. Wrap in a Knot Wrap and hide in the tree’s branches for a sumptuously scented treat. You may also notice from the bar above that their products are mostly sold "naked". The Naked line "features its “bare-all” packaging approach, in which 80% of the seasonal range are offered in solid form without the use of plastic bottles or any packaging; thus, also called the naked alternative.". Apart from less waste, stripping products off unnecessary packaging also allows the brand to invest its production savings towards increasing its manpower and training them appropriately. Another good think to note: products from the Naked line such as its body butters are formulated with little to no water and are therefore often innately self-preserving. Good stuff for the pocket and the planet! These all-occasion, reusable fabric wraps come in different sizes and are made from recycled plastic bottles and organic cotton. The fluorescent one on your right's so pretty! Twinkle twinkle little star, bubble wand and sparkle jar. Candy showers, citrus soap, star light through your telescope. Twinkle twinkle little star, the finest Christmas treats by far. No stars were harmed in the making of these sweet, sweet, sparkly treats. 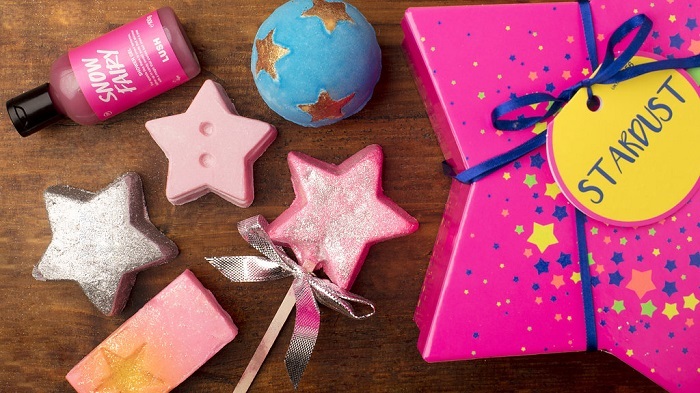 Lavish your skin with candy showers and honeyscented soaks and feel like a star. Spread joy to the world with scrubs, bombs, and bubbles to delight and excite all kids from one to ninety-two. You won’t find a bottle, pot or wrapper anywhere in this joyful gift, except for the box of course.